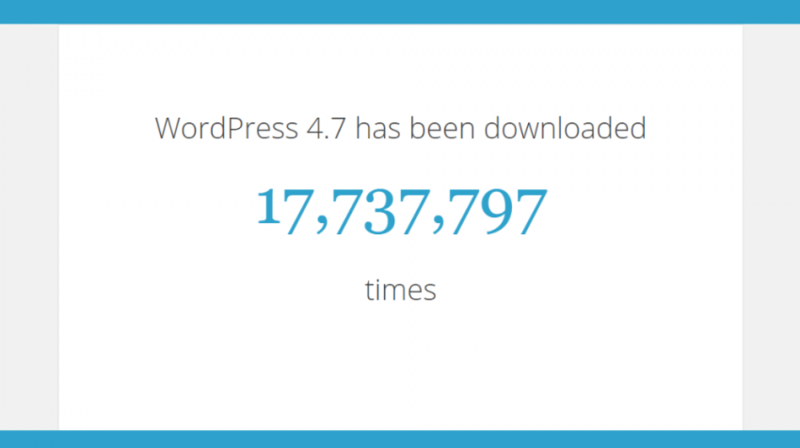 Just a little over a month after its release, WordPress version 4.7 has been downloaded over 10 million times, according to the official WordPress.org blog. WordPress Version 4.7 was released to the public on December 6, 2016. WordPress 4.7, nick-named “Vaughan” in honor of legendary American jazz vocalist Sarah “Sassy” Vaughan, made significant improvements to previous versions of the popular blogging platform. According to WordPress.org, Vaughan brings your site to life with immersive featured images and video headers in a brand new default theme dubbed “Twenty Seventeen.” Twenty Seventeen focuses on business sites and features a customizable front page with multiple sections. You can personalize the default theme with widgets, navigation, social menus, a logo, custom colors and more. “Our default theme for 2017 works great in many languages, on any device, and for a wide range of users,” writes WordPress lead developer Helen Hou-Sandi in a post announcing the release of Vaughan on the official WordPress.org blog. While Vaughan has been enthusiastically received since its release in December, developers say versions 4.7 and earlier are affected by at least eight security issues and a number of bugs. To fix these issues, WordPress developers this week announced the immediate availability of WordPress 4.7.1 security and maintenance updates. WordPress 4.7.1 also fixes 62 bugs from 4.7. “This is a security release for all previous versions and we strongly encourage you to update your sites immediately,” explains WordPress Core Contributor Aaron Campbell in a recent post announcing the release of WordPress 4.7.1.